Gifts for a wonderful life! How God wants us to open the gifts he has freely given us because of Jesus. 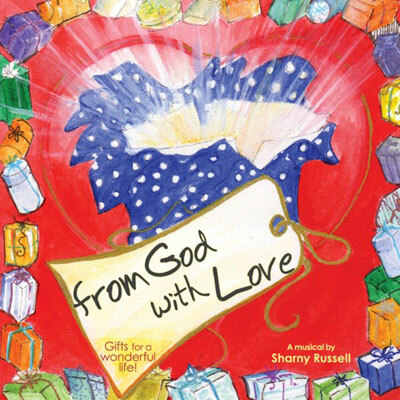 • A delightful musical explaining the many gifts we have received from God through the one gift of His Son Jesus. • Suitable for primary age, but also adaptable for high school age. • 4 speaking parts. 2 mime parts (unlikely looking angels). Songs performed by choir or whole classes – View Cast List. – View Sample Script. • Overture, 11 songs, and several instrumentals for mimes etc. Options for solo or small group singing as well as full class performances of songs. View specific performance options for a primary/junior school – View Performance Options. Listen to some SAMPLE SONGS further down this page. • Can also be performed by a choir or adult ensemble, as a cantata, with the dialogue being performed minimally as a link between songs (Sharny’s mother Peg Russell made SATB arrangements of most of the songs before her death in 1998). • Approximately 80 minutes in length. Three young people discuss the subject of gifts as they wrap presents together, either for Christmas, or for a friend’s birthday. They find themselves relating the whole idea of giving as something from the heart of God, and eventually discuss God’s ultimate gift of His Son Jesus and the many gifts that are part of that package, i.e. love, forgiveness, peace etc. Alongside of them, and apparently “invisible” to them, is the Holy Spirit, who continually prompts the conversation, and this scenario provides some quite comic moments! The songs highlight each point in the discussion, and can be presented by a separate choir, choreographed groups of singers, small vocal ensembles, or soloists. Or even the speakers themselves. As with all of Sharny’s musicals, the format is entirely flexible. Great message and music from one of Australia’s foremost composers. (Can be presented by schools, churches & smaller groups. Full production kit available, with music scores and backing CDs.) All ages. Book: •Production notes with costume, set & props suggestions • Cast List • Script • Piano/Vocal Music Score for 11 songs, plus overture & incidental music. 2 Audio CD’s: • Demo performance (to listen & learn from) • Professional backing tracks (for performance of musical). Data CD: • Script for copying • Piano/Vocal Scores for copying • Lead Sheets of songs for copying • Cast List for copying • Lyric Sheets for copying • Image of musical for posters and advertising. NOTE: If you wish to purchase multiple CD’s or Books, please email Sharny. A license is required to perform this musical. You are able to purchase an Instant Licence when you purchase this Production Kit.